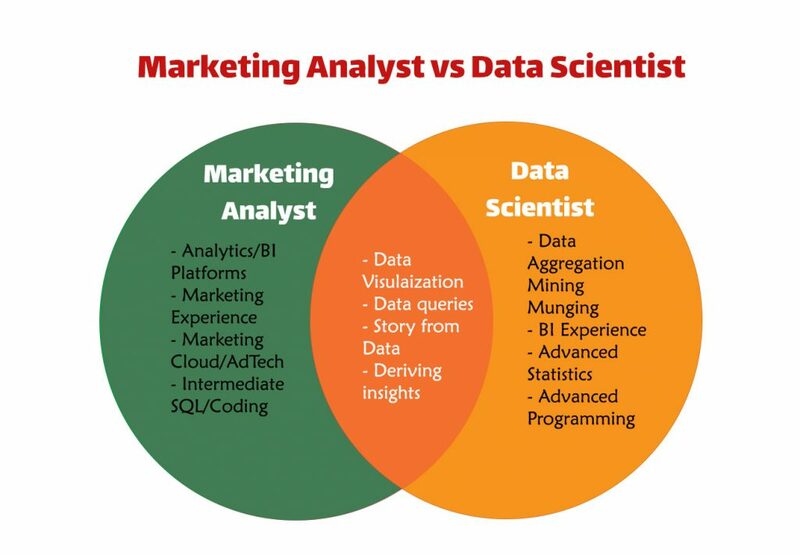 Marketing Analyst vs Data Scientist: What's The Main Difference? 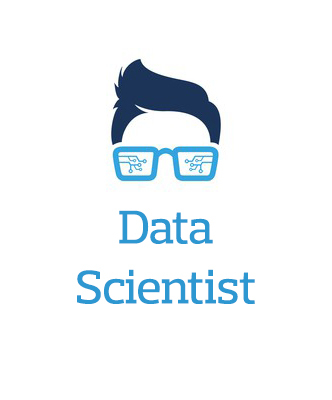 Home > Blog > Marketing Analyst vs Data Scientist: What’s The Main Difference? While data doesn’t come in neat little packages, ready to answer the questions marketers concerned about, the demand for sufficient marketing data is the main factor that is shaping the roles of marketing analytics field. Starting with the background: When data science brought many trackable capabilities to the marketing department, marketers had assign dedicated professionals who are accountable for using data to answer the marketing problems and furthermore to understand the performance metrics. Yet, the issue we did face in the last few years is the rapidly growing data resources (online, offline, internal and external). The data aggregation itself was a major challenge for every marketing departments. In 2017, everyone in the field was talking about the need to grow their data analytics team. With the higher pressure on the efficiency and accountability of marketing KPIs, the marketing department functionality started to evolve and play more important roles within to the organization. We can see now how marketing analytics is not only limited to sales data but also connected with customer support, business automation, and financial department. However, since diving into data team, in general, is becoming a complicated structure due to the rise of Big Data, Data Mining, AI, and ML, I will try to avoid the hierarchy of business intelligence filed and focus precisely on the marketing needs. 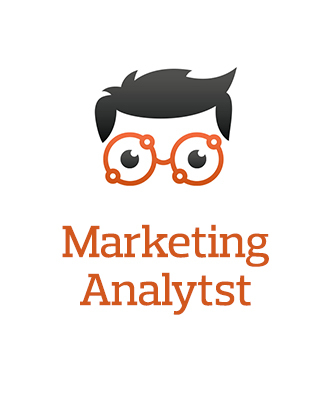 Ideally, marketing requires two roles of data: Marketing Analyst and Data Scientist. Why? It’s quite straight-forward to the point of marketing needs, the two function is our way to define the data team role within the marketing department, how they are different? The most common scenario in marketing departments is the need for an analyst to dominated the marketing analytics and a data scientist to operate the company data aggregation. Why am I trying to simplify this into two main roles? In companies, we would always see a variety of business needs and marketing functions which requires a customized structure. Apparently, you might see a variety of positions and titles based on the common needs of the organization and nature of the business. An e-commerce business might have a large set of data team while a startup might be only hiring one person, so don’t get confused and let’s first focus on how to distinguish the main differences between the basic two roles every organization need. The main difference between marketing analyst and data scientist is that marketing analyst should be a native marketing-speaker with professional skills in driving insights to answer the marketer’s needs. On the other hand, a data scientist is a native data-speaker with skills in deriving BI and analytic insights from structured and unstructured data sources. Marketing analyst should have a solid experience with marketing metrics while it is not required in data scientist role. The data scientist is expected to formulate the critical questions that will help the business and then use the data to solve it, while a marketing analyst is given questions by the marketing team and pursues a solution with that guidance. The marketing analyst not required to be advanced in programming side while the data scientist should be professional in writing queries. Yet, both roles should work with IT teams to source the right data. The data scientist role requires a strong data visualization skills and the ability to convert data into a business story. A marketing analyst is more focused on analyzing the marketing metrics. The data scientist usually work in a multidirectional and free form in order to extract better insights, while marketing analyst usually has a specific direction to work on. The marketing analyst is similar to any other analyst in terms of methodology but he is truly different when it comes to the functions. So why is that? I strongly believe that marketing analyst is a digital marketer which luckily become a master of analytic tools. You might disagree since you would meet a lot of marketing analysts who didn’t have any experience in marketing. I know this because I suffered from this for awhile and always had conflicts with data-savvy specialists who failed in understanding our marketing needs since they simply lack the marketing background. However, marketing analysts should be very solid in understanding the function of marketing and its objectives. I am confident to say that marketing experience is crucial more than you might expect. The marketing analysts are located at the heart of marketing team and should speak their language and suffer with them from the same problems. Measure the effectiveness of marketing activities and the online ROI, of various marketing channels used to position a product or service. Given the increasing variety and complexity of marketing channelsreaching this objective is a serious challenge. Bring the data analytics into the heart of all marketing campaigns and tools while setting up the most effective metrics to measure and trends to manage. Turn insights and data patterns into clear indicators and tactics for growth hacking, budget allocation, and performance management. Maintain a reliable and effective connection between the marketing specialists needs and data scientist reports. Who is the best Marketing Analyst? A native marketer who knows how to play professionally with marketing technology tools and marketing metrics. A scientifically minded person with an appreciation for design. He needs to know the effect of messaging and design on the consumer experience. Analysts by the heart who dominate the dashboards and he have charts ready even for his grocery shopping habits and his girlfriend mood swing. He knows that insights are more important than figures. He loves the data in front of him but he is more in love with knowing the consumer. He is the honest guy who never takes any sides. Neither marketing performance team nor data team. Business acumen is the main asset desired in a marketing data scientists, after technical skill. It’s so critical because a lot of quantitative candidates I’ve seen are getting so wrapped up in the elegance of the analytics that they forget that they’re hired to answer business problems. Working with marketing team is somehow challenging for data scientists. The marketing ever-changing periodical strategies can be a roller coaster for data team and they have to adapt and survive quickly. Unlike the majority of businesses where the top element of the data science job is the ability to use computing power to acquire the data, marketing needs could be problematic and tactically challenging over the time. Who is the best Data Scientist? Tech-savvy with different programming languages and statistics capabilities. A scientist who applies statistical tools, economic tools, and different disciplines is another facet. He is an expert in interpreting the visual display of complex data sets and tells a story. Your marketing analyst should deliver the clear results in marketing language while the data scientist should work on doing the math (statically and technically). Technically, a marketing analyst is solid at creating relations between data and marketing needs while data scientist is the true advocate in bringing the data and advanced statistics and bring the most reliable, clean, fastest results to the table. You have known knowns, known unknowns, and unknown unknowns. Just be careful if both get a conflict. I have seen some violent fights at the office! There are many times where the underlying data that is the basis for what people have calculated is actually wrong. If you make a mistake with the underlying data, that could be a big problem while you analyze. The premium on being able to understand what data you have, to understand what types of questions can be answered with it, and to make smart decisions is really, really high. However, there are places where pure data science functions can fall short of what’s required to boost success in the marketplace. This is where marketers thrive. Looking for your opinion on this and how do you see the difference between the two roles. Contact me if you are looking for marketing analytics consultant.